Rogue | Kris Johnson's Blog…sort of. How this managed to escape my attention is beyond me, but thanks to the ever-watchful David Mead my eye is now upon it. 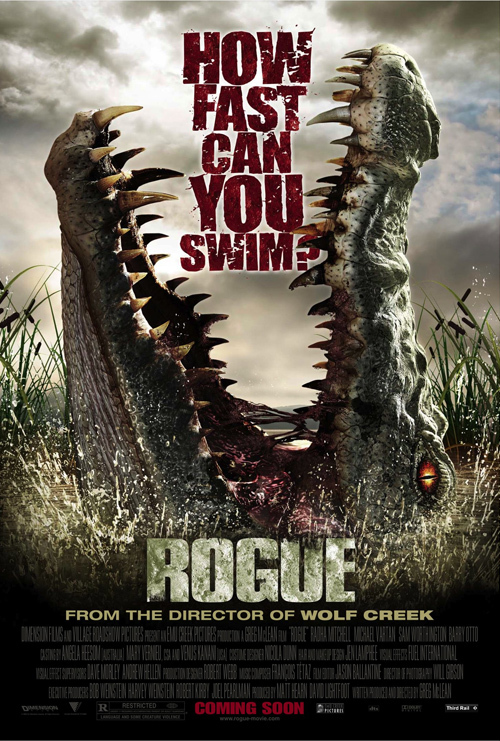 Rogue is not the latest spinoff from the X-Men franchise (sorry, Anna Paquin), but rather the tale of some hapless tourists lost in the wetlands of Australia. You know, where the hungry, hungry crocodiles live. There’s no trailer available yet, but with a release date of 25 April, the folks over at The Weinstein Company had best shake a scaly tail and give me a thirty second montage of quick cuts, snapping jaws and plenty of screaming. EDIT: I’ve found two different trailers online. One is the very thirty second montage I was looking for, with very little dialog but plenty of quick shots and shrieking. The other is a couple of minutes long and goes on about unnecessary things like premise and plot. Bo-ring.